Thumbtack clone script is playing an important role and that made as service provider platform. customers can recruit local services and obtain reference immediately. 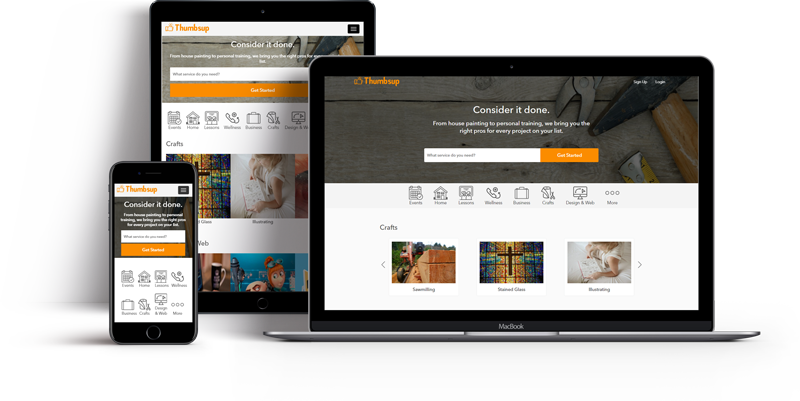 Thumbtack clone is a fast-growing one. since it has well classifieds and review site that bind in a glowing sophistication for the services in local. Service marketplace script is an online marketplace platform. so users can find help from their neighbors for their daily tasks like gardening, caring animals, plumbing, cleaning etc… this clone has played and provided the interface between the freelancers (labors) and the customers. It is the best place for service experts and job providers about service categories to clarify business, legal matters, and web design, technical support etc… most of the business persons are searching for clone script of this website. Therefore they can easily initiate a service site with user-friendliness. A handyman can make their availability simple. And choose to treat Customers within your free hours. Customers can view the detailed profile of the concerned Handyman’s years of experience, specialties, visiting fees. And thereafter finding the nearest radius of the Handyman with satisfaction. Customers can book a date with the nearest Handyman. For any type of services required for the Customer anytime they need. so they can easily cancel the booking without any problems. Customers who have booked the services of the Handyman. Then,they will receive details of the Handyman and vice versa. You can choose to pay for joining payment with your Debit or Credit cards that will be directly reduced from your cards. With Geolocation services, Thumbtack Clone App can find each other on maps and their location with comfort. The Customer can choose a specialist by making grow. Then, they use the given search engine and find out the required special handyman for your service.